The Washington Capitals forward talks about victory in the World Championships, Olympic disappointment in Sochi, the upcoming NHL season, and his love for sports cars. RBC Daily: Alexander, the season was an ambiguous one for the Russian national team. On one hand, there was the failure at the Olympic Games; on the other, the victory at the World Championships. 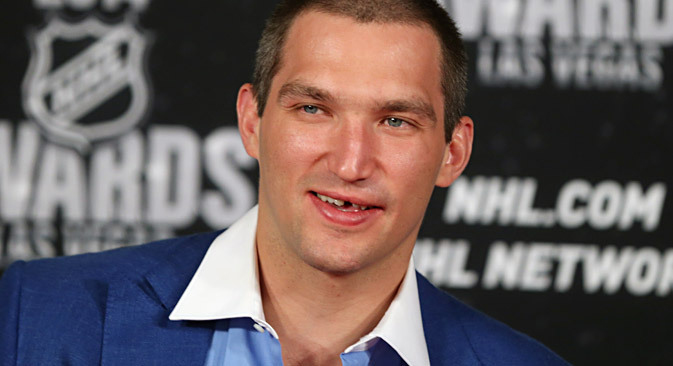 Alexander Ovechkin: I would give the season a four out of five. If we hadn’t won the World Championships, it would have gotten a lower rating. RBC Daily: It has already been nearly half a year since the Olympics in Sochi. Has there been a change in attitude towards the failure? A.O. : Well, what could have changed? We lost in the quarter-finals. A half a year passes, a year, two – and this fact cannot be fixed in any way. Nothing has been forgotten, and as the defeat sits in the heart, it stays there. It is good that the NHL season started up again rather quickly, I managed to get involved in the game and worry my head about other things instead of dwelling on the loss to the Finns. A.O. : We played fine together! There was enough of everything: mutual understanding, support. We just didn’t deliver results. RBC Daily: Doesn’t it gnaw at you that the Games in Sochi were the last chance to win the Olympics in a battle with the best NHL players? Seeing how the negotiations between the NHL and Olympics-2018 Organizing Committee are going, the league’s hockey players are hardly likely to go to South Korea four years from now. A.O. : We’ll live to see. It’s still too early to look that far ahead, four years into the future. The negotiations with the NHL were not that simple before Sochi either, but all of the best hockey players came anyway. A different matter, that was incredibly shameful, was that we failed to make our fans, relatives, and friends in the stands happy. RBC Daily: There has been another change of coaches at Washington. Barry Trotz, who had been working in Nashville for the past 15 years, has come to replace Adam Oates. How well do you know the demands of this specialist? A.O. : We have already met and talked, during the individual awards ceremony in Las Vegas. We talked one-on-one for nearly an hour and he told me what he expects from me and the team as a whole. I think that he has already managed to meet with my other partners on the team and convey his vision to them. RBC Daily: Have you talked about his role in the team? A.O. : It hasn’t come to that yet. We talked about general topics, got to know each other. Trotz is a cool guy, although I know he’s a strict specialist, I don’t think any problems will arise with him. RBC Daily: Last season the Capitals didn’t make it to the play-offs for the first time in a long while. Why did this happen? A.O. : Bad luck and misfortune. I can’t really give you a more specific answer. The backbone of the team has been preserved and we’ve strengthened with new hockey players. We’ll see how everything goes in training camp in mid-September. RBC Daily: Ilya Kovalchuk has been practicing in Serebryany Bor [a park] with a personal trainer over the past few summers. Have you already begun preparations for the season with an individual program? A.O. : Yes, we’ve already been working with the new trainer for a week. I can say that I’ll train alone all summer with a program that I used before, and new methods will be added, and I’ll be fully ready for the start of the season. RBC Daily: At Washington you now have a new Russian partner, Evgeny Kuznetsov, whom you have taken under your wing. Is it a purely Russian tradition in the NHL that a team newbie lives in the home of a club veteran at first? A.O. : Zhenya is a great guy and not a bad player. I think he’ll continue to develop. I don’t know how it is with the Swedes, Czechs, or Finns, but for us this comes from the desire to help. I remember how things were difficult for me in America in the beginning. Now I want for Zhenya to get acclimatized to the U.S. as fast as possible. A.O. : We tore up the internet with this video! Although we didn’t plan it specially, we just posted it on Instagram and it just took off from there by itself. He and I love to joke around in general. He’s a very happy guy and loves such pranks. RBC Daily: Alexander, it’s common knowledge that you are a big automobile lover, that there are several cars in your fleet, and that you are a big fan of racing. Do you enjoy Formula 1 racing? A.O. : I’m a fan of fast and comfortable automobiles and Mercedes is my favorite. I follow Formula 1 but not very carefully – although I think that I will pay more attention since this year Gillette [Ovechkin is Gillette’s international ambassador – RBTH] will sponsor the McLaren team. When professionals get together in the knowledge that they are creating truly cool and high-tech things, I think it’s worth paying attention. This is an abridged version of the interview first published in Russian in RBC Daily.